Acu•tonics®, n. 1. System of vibrational sound healing rooted in Oriental Medicine and philosophy that utilizes tuning forks and symphonic gongs tuned to the planets, Tibetan bowls, bells, drums and rattles. 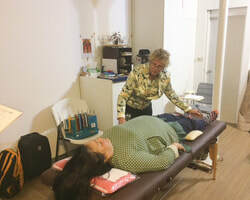 Connecting body, mind, and soul in the journey toward optimal health and spiritual attunement or at-one-ment with all things in the Universe. 2. The integral way, undifferentiated wholeness, the Tao. Laurie Herron and Katie Mink L.Ac. are Senior faculty members of Acutonics® Institute of Integrative Medicine. They are certified to teach and offer all of the curriculum currently listed through Acutonics Institute of Integrative Medicine. For more information about the classes listed, please go to the classes page for descriptions and tuition information. Interested in finding out about what Acutonics is? Click here to find out more. "Katie and Laurie are an AMAZING team with their combined skills! The variety of TA's was appreciated. The treatment rooms and tables were very comfortable. Great location!" "I had a fabulous class with you two this weekend! So much to learn and such a powerful new tool!! Love your teaching styles! I am looking forward to more classes with you! "I am awed by the passion and fire you have for this art/medicine and the clarity and openness of your teachings." This class is open to anyone who has taken Level I! ​Are you waiting for Level III? Let us know! Opportunity for clinical hours at Bancroft Center of Chinese Medicine Saturdays from 4:00 pm - 6:00 pm. This will be a monthly opportunity. We will post the dates available soon. We will be teaching each level of Acutonics in 2019. Keep checking back as we update our calendar for the year. If there is a class you are interested in taking that we do not currently have posted, please call 925-849-6006 or email to inquire about potential start dates. Receive information about upcoming classes and forums, news and events in the Sound Healing community and seasonal protocols.